An Indianized fusion pizza is what you need to brighten up your weekend. 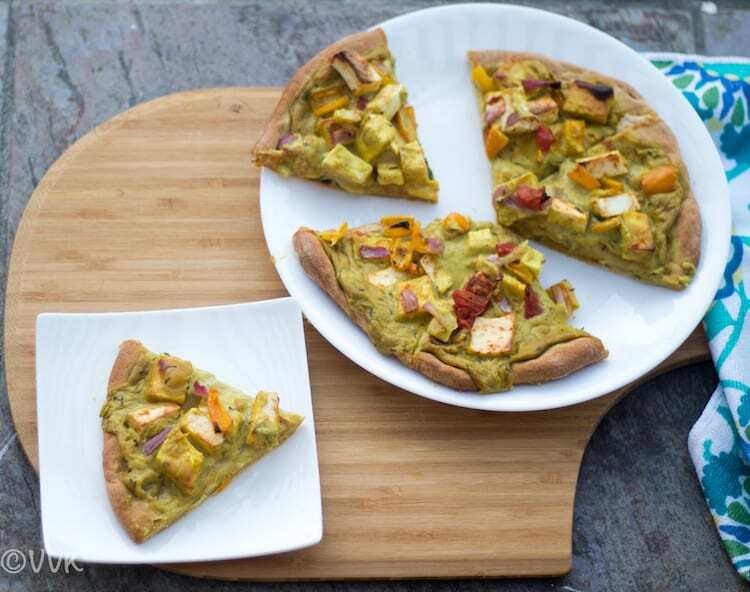 How about the Shahi Paneer Pizza with wheat pizza base? Sounds interesting right? That’s what I am sharing today. 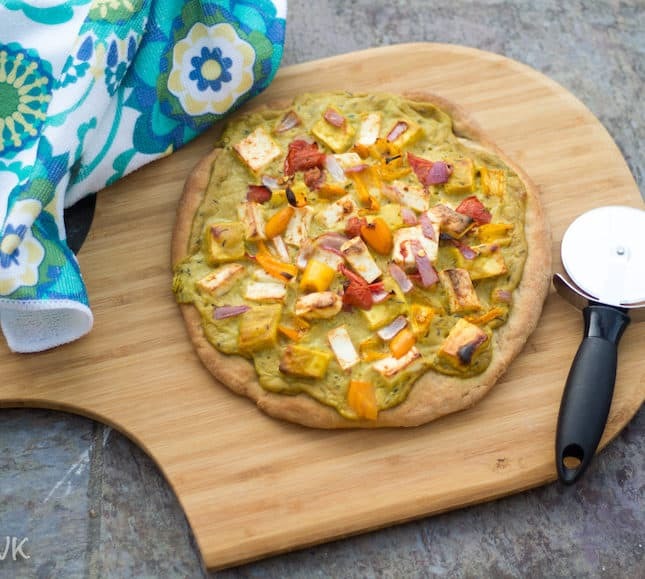 Shahi Paneer Pizza – A wheat pizza topped up with Shahi Paneer and more paneer, bell peppers, onion, and tomatoes with a zing of chaat masala. 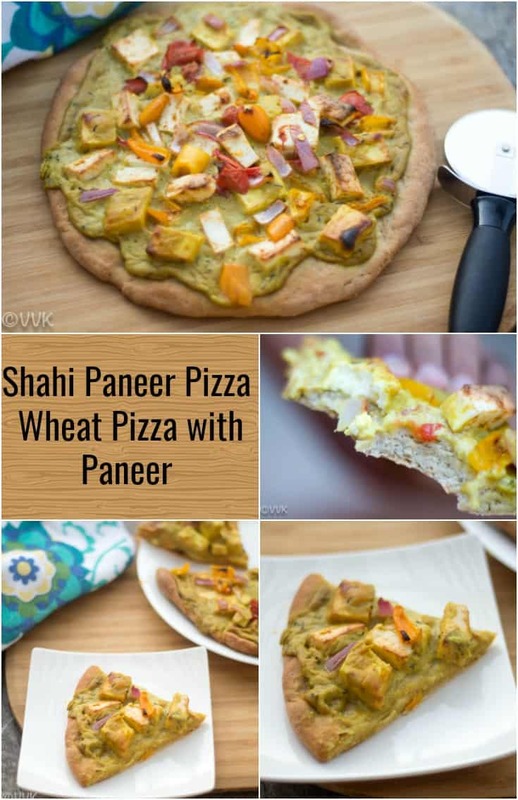 Scroll down to see the step by step pictorial recipe of Shahi Paneer Pizza. 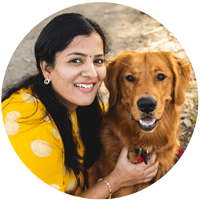 In Bay Area, we have a lot of Indian Pizza places where they serve paneer tikka pizza, Shahi paneer pizza, chicken tikka pizza and what not. You name it, and you will get it. And some places serve half and half pizzas that it is you can pick one topping for one half and another topping for another half. 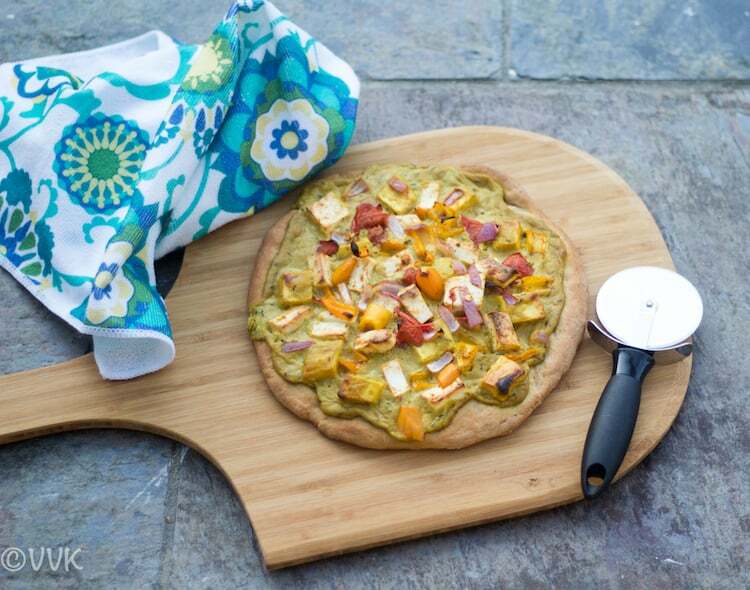 These Indian pizza shops inspired me to prepare this Shahi paneer pizza. 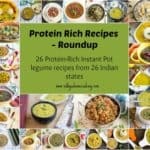 Wondering why I am posting a pizza recipe all of a sudden? Many of you might have guessed it. This week’s BM theme is Pizza and I starting off with this yummylicious Shahi paneer pizza. The Shahi paneer that I posted on Wednesday was prepared exclusively for this pizza. But you can always use the leftover gravies for this. 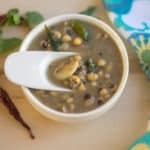 Now you know what to do with the yummy leftover gravies. I did not plan to make a wheat pizza base. But suddenly I decided to go with wheat flour instead of APF, and also I realized that I had posted only thin crust pizzas on my blog. I am not a big fan of thick crust, so for this pizza, I decided to go with not so thin crust and also as vaandu was not around when I prepared this pizza, I shaped it by hand. A wheat pizza topped up with Shahi Paneer and more paneer, bell peppers, onion, and tomatoes with a zing of chaat masala. 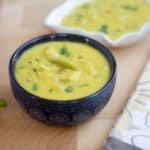 Prepare Shahi Paneer as mentioned here, or you can use any of your paneer gravies. If you want an APF base, please follow the steps in this recipe. The amount of water added depends upon the quality of the flour used. So adjust accordingly. 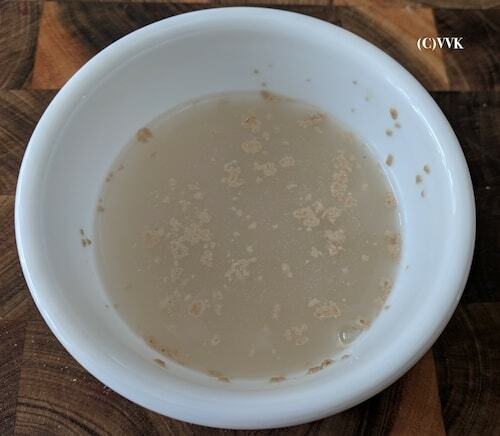 Dissolve the sugar in 1/3 cup of Luke warm water and add the yeast. Stir it once and let it sit for 5 minutes until the yeast activates. Meanwhile sift the wheat flour and add in the salt. 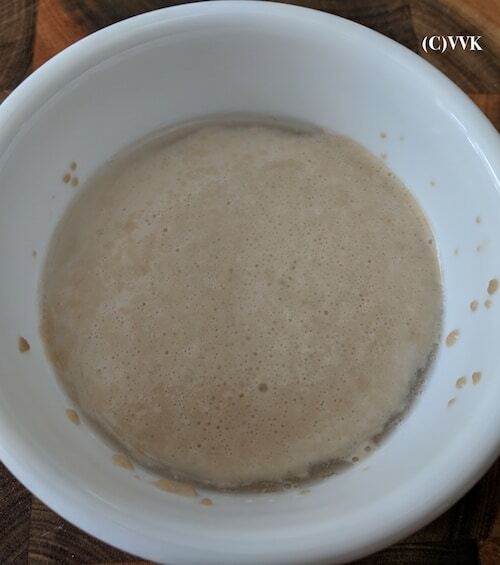 The yeast mix should like frothy like below when it’s activated. Add this to the flour and mix. Little by little add water and knead the dough for at least 5 minutes. Make sure the dough is not too dry and not too watery/loose. Grease a bowl with oil and spread some oil on the dough also. Cover it with a cling wrap and let it rise. It took me about 2.5 hours for the dough to grow. 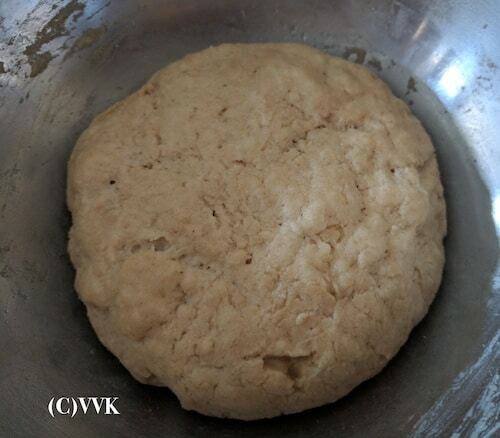 Once the dough has risen, punch it down and knead again for couple of minutes. Make it into a ball. I transferred the dough to the back of a round plate which I dusted it with flour before. First, press it down into a small disk. 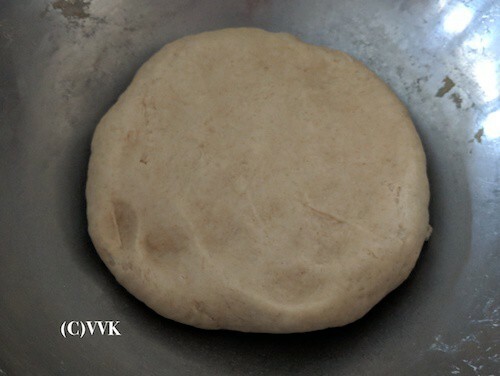 Slowly stretch/push the dough with your fingers working from center towards the edges, make the disk larger. The round plate helps to maintain the shape but you can press the dough on any dusted surface. Add oil when required. It helps in spreading the dough. Hand stretched dough doesn’t need to rest but there is no harm in letting it rest for up to 15 minutes. If you are using a pizza stone, preheat the oven to 500 deg F with the pizza stone inside. If you are using a regular baking tray, pre-heat the oven to 450 deg F. Make sure the aluminum foil or the parchment paper that you are using to on the tray can hold the high temperature. Meanwhile chop the paneer, bell peppers, onion and tomatoes. Add the chaat masala and salt and toss them nicely. Ensure the masala is coated evenly. If the Shahi paneer is cold, bring it to room temperature. If using a pizza stone, Once the oven is preheated, carefully remove the pizza stone from the oven. 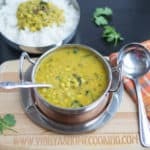 Sprinkle some corn meal or rava. Now transfer the pizza base carefully to the stone. If you are using baking tray, transfer the base to the tray. Spread the Shahi paneer on top evenly followed by the paneer-bell pepper mix. Do not spread until the edge as the toppings might overflow. Bake this for about 12 minutes until the crust and paneer are browned up. Let it cool a bit and slice them and serve it hot. Adjust the spices, toppings as per your preference. Panner tikka masala, kadai paneer can be used too. If not like naan pizza you can use tomato sauce and top it with flavored paneer. 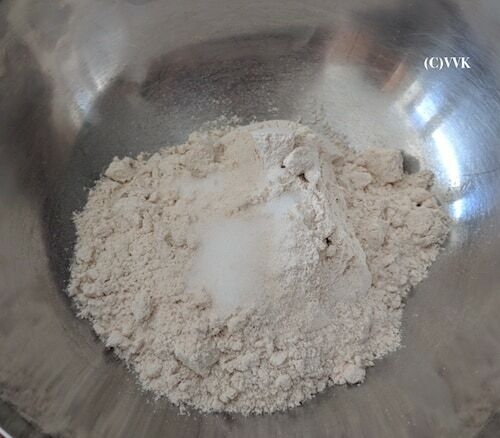 If using instant yeast, directly add it to the flour. 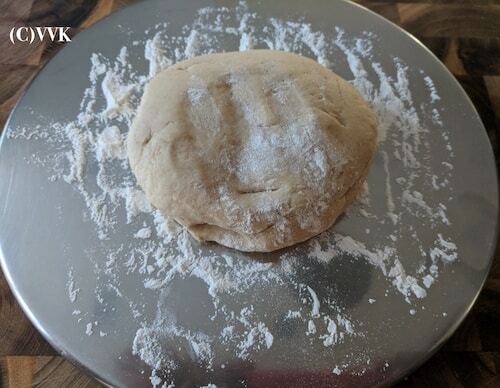 The dough rise is completely dependent on the temperature, and recently I learned the more you bake with yeast, your kitchen is prone to have more wild enzymes which result in dough rise in short span of time. If the weather is cold, placing the dough in the oven (of course not turning it on) or top of fridge might help in a fast rise. The baking time depends upon the oven setting and also the position of wire racks. I removed my top and bottom tray and always baked in the middle. The other primary factor is if you are using a pizza stone, the hot pizza stone speeds up the cooking time, so it is always 3 to 4 minutes less than the non-pizza stone baking. Last but not the least, the thickness of the crust and the toppings play a significant role in the baking time. If the crust is thick, then bake it for a more extended period. For toppings like Shahi Paneer, you need more time. As a rule of thumb, if my crust is thin, I bake for 8 minutes and check if it’s done. If my crust is thick, I cook for 10 or 11 minutes and start to check. Depending upon the doneness I adjust the baking time. A wheat pizza topped up with Shahi Paneer and more paneer, bell peppers, and tomatoes with a zing of chaat masala. Now that is one pizza I will not like to miss. 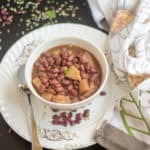 Love the use of wheat flour for the base. Fusion Pizzas are the best and I think this pizza will be very delciious as I love shahi paneer. Simply love pizzas with paneer on the top and this shahi paneer pizza is a real torture for me, cant wait to make some soon. :-) Please do make it Sandhya. Have tried paneer tikka pizza and shahi paneer pizza totally amazes me.. Should try this out soon!! 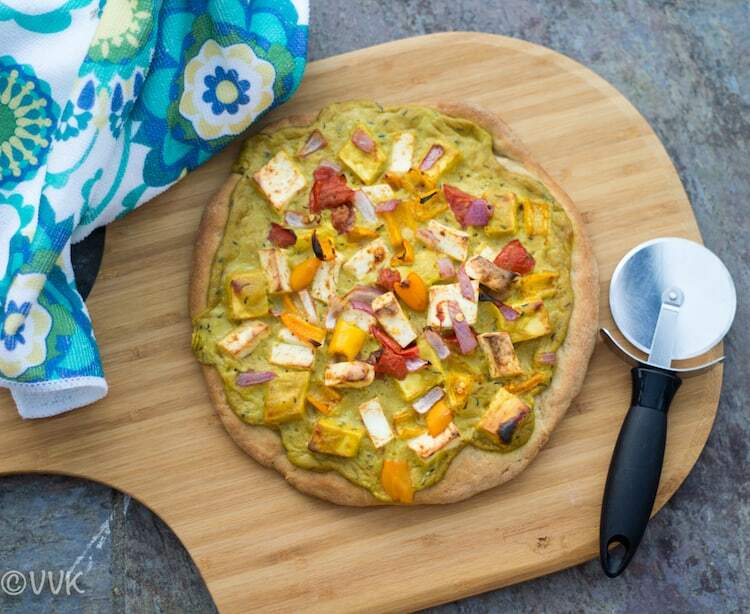 Love the Indianan flavors in the pizza and this one looks tempting with shahi paneer. I heard about these Fusion Pizza joints in the Bay area. Not so popular around our place. But I am sure I can make it at home. Looks very tempting. Wow Paneer pizza looks soo good. Mouth watering here….. I love our Indian fusion pizzas and if its with paneer, nothing like it..love your shahi paneer pizza Srividhya, it surely looks sinful! Thanks you so much Valli. That pizza looks fabulous. Paneer pizza is my guilty pleasure….now I am so tempted to have one! We love hand tossed pizzas , and using wheat sounds fantastic . The rage is of fusion pizzas , and the paneer ones are the real in ones . Beautifully made , I am drooling over this Paneer pizza .